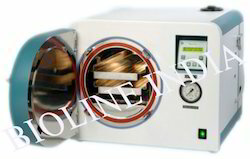 Used for medical equipment that cannot be packaged, sterilized, and stored before use, the offered range of Flash Steam Sterilizers has a high preference in the market. Manufactured using the highest grade of raw materials that are available, its quality is never compromised. The offered range comprises of High Flash Steam Sterilizers in a number of specifications. Ideal for all applications requiring rapid, reliable & total destruction of all living microorganisms. · µP Controller with following parameters programmable by user. Sterilizer time: up to 99 minutes. Sterilizing Temp. up to 1340C. Drying Time: up to 99 min. Looking for Flash Steam Sterilizers ?